Sir Michael Fallon, the Defence Secretary announced: “This floating fortress is by far the most powerful ship ever built in Britain”. 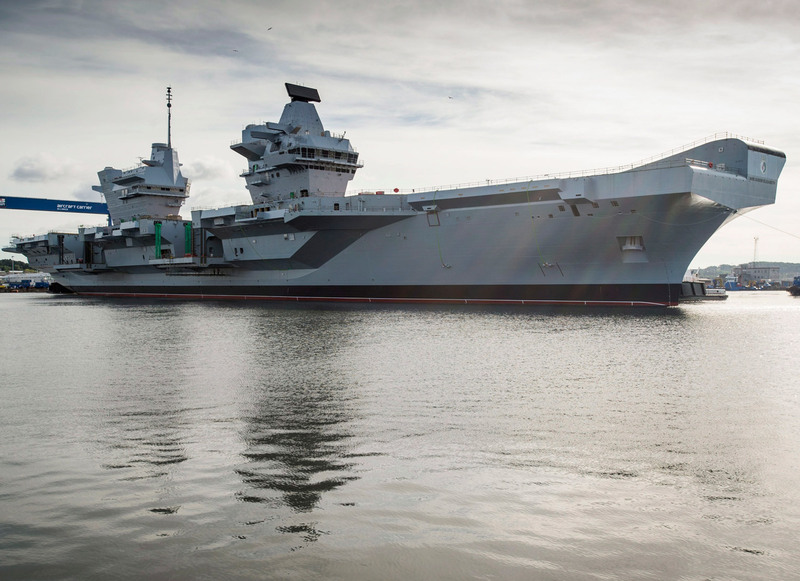 “HMS Queen Elizabeth is an enduring example of British imagination, ingenuity, invention”. That’s some statement. Worth reflecting on that. “British imagination” creates a warship that will exert our military power and authority in the world for decades to come. That is the enduring symbol of our ingenuity and innovation in 2017. As statements of raw militarist propaganda these can’t really be improved on. At a cost of £3.5 billion she didn’t come cheap. The British state is a military state. There is of course a connection between surveillance technology, our relationship and support for repressive regimes abroad and commercial interest. But there is also a very thin line between elected representatives and the board rooms of the are industry. This from CAAT. If you’ve appreciated this post, please think about subscribing to the Bella Caledonia – or making a donation to help us keep this site going. The one big problem that carriers of this size for their safety sail as part of a ‘Battle Group’, comprising several defensive rings of cruisers, destroyers/frigates and submarines. The current strength of the RN is, 6 Destroyers, 13 (Aging) Frigates and 7 Fleet submarines. Just about enough to protect one carrier but removing protection from everywhere else. Fallon should go and read his history of WW2 and 10th December 1941 to find out what happened to Prince of Wales and Repulse off Singapore when two major Capital Ships were sent to sea with insufficient escorts. There is also the not so small problem of lack of qualified personnel and the lack of aircraft. Exactly – Aircraft carriers are nothing more than a floating target these days. This government is far too concerned with “projecting power” with big-ticket willy-waving items like these and trident; desperately trying to impress the Americans, who wouldn’t really care to urinate on us if we were on fire. It would be far more effective to spend money on (a) new frigates & more conventional submarines, and (b) making sure the existing vessels are fit for purpose. Oh, and long-range reconnaissance aircraft, since they scrapped all of them. One missile-strike and it’s gone. can`t have all these admirals strutting about Whitehall with only a few wee toy boats to play with. think big! “The first (carrier) will not be in service (if you can call it that) until 2017. It has had to be converted to take aircraft that it was not originally designed for, and those aircraft won’t be ready until 2020. And, the Ministry of Defence procurement division showing its usual acumen, the jet aircraft in question are the too-expensive American F-35s. According to Lewis Page, because of design and cost, “the big new carriers will sail the seas largely empty”. Well, I saw 4 microlights flying over my house in the Borders yesterday. I think they were heading for Rosyth. Hope it has a Mary Rose ending. I have had a ridiculous idea for a wee while. We are building two of these brutes. On independence, we should take one of them. We should paint red crosses on it’s side, we should stuff it with aid, and we should become International Rescue. It should have absolutely no military ability, beyond perhaps an ability to protect itself, and it should sail the seven seas doing good. It could be a contribution towards global harmony. The idea would be to project soft power. Not as daft as you might think. Didn’t they fit a whole train out as an eye hospital, India I think, so where there’s a will and all that, good luck. Indeed, not daft at all. Such a vessel would make a wonderful resource for disaster relief around the world. Station one in the Atlantic, say the Azores, the other in the Pacific, say Hawaii, and load it all the paraphenalia needed for such an effort – temporary prefab accommodation for tens of thousands, water purifiers, sanitary equipment, food, cooking stuff, medical supplies etc, etc. They could be leased by the UN for such a purpose. Heavy lift helicopters would be fine in this effort. Good idea Duggie, perhaps a letter to Corbyn making this suggestion might worth doing? The carriers represent merely another highly dubious UK government ‘procurement’ in the long list of transfers of UK public money to the Tories corporate friends and funders. The desperation for prestige, for something to boast about, is extraordinary. England – for that is what they really mean – just has to be big, great, showing these foreigners “military power and authority”. But the world has changed, and Britain is very weak and lacking in prestige; accompanying this there has been a commensurate increase – helped by a more garish and trivial media – in flag-waving and boasting and huge celebrations of any success. It’s all too evident that, behind it, there’s a fear that there’s really nothing much left. There was one of these comparison thingies on MSN the other day looking at how much each country spends on defence. America was far and away the most spendthrift with £400 billion. China was next with about £130 billion. Good only Blighty was next with £40 billion, beating France and Germany by some £15 billion. But maybe it is simply a way to surrender quickly and relatively painlessly to the enemy, as our will to fight is immediately quenched by the sinking of the pride of our navy named for our illustrious mascot. No dying in the last ditch for us! Aye I would be fighting in the ‘last ditch’ if I was fighting for Scottish INDEPENDENCE, just as my fore=fathers did at the GPO in 1916.